With more than 1 million albums sold worldwide and an impressive track record that heralds them as the fastest-selling debut artist in the 26-year history of Sparrow Records, ZOEgirl has managed to create a success story that continues to get bigger and bigger with the release of each new album. Performances at venues like New York's Madison Square Garden, The Rock & Roll Hall of Fame and Walt Disney World have helped ZOEgirl become one of the top female pop groups in Christian music-a platform upon which Chrissy Conway, Alisa Girard and Kristin Swinford keep building brick by brick. 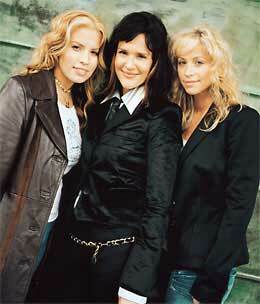 ZOEgirl exploded onto the scene in 2000 with the group's self-titled debut, scoring four Top 5 radio hits. They followed with a sophomore album, Life, which continued to propel the girls' blossoming career. Those first two projects placed ZOEgirl in front of hundreds of thousands of fans on stage with artists such as Newsboys, Plus One, Avalon and Carman. Following the late 2003 release of their last album, Different Kind Of FREE, ZOEgirl hit the ground running as a featured artist on the 25-city Shoutfest tour before heading out on their first headlining tour in early 2004. The FREE Experience tour, which also featured Superchick, Joy Williams and Focus on the Family speaker Susie Shellenberger, was a huge success with audiences across the country. The FREE Experience tour saw sell-out attendances in many markets during a year when the touring industry was taking a hard hit. Now, with Room To Breathe, their first new album in over a year, ZOEgirl is moving forward with some of the most compelling music of their career. Produced by Mark Heimermann, "Double Dutch"(Robert Marvin), Josiah Bell, Shawn Shankel, Tedd T and Dan Muckala, Room To Breathe encompasses ZOEgirl's growth as singers, songwriters, artists and women. "I think with each album we've been able to integrate more and more of who we are," Alisa says. "We've really seen a need and have been trying to fill that void for young girls to have a different option when it comes to pop music, and we've done it without trying to fit into any kind of mold or demographic. I think we've just really focused in on who our listeners are and what they want to hear." As every recording artist knows, longevity does not come easily in a fast-paced music industry that is constantly chasing the next big trend. But ZOEgirl's biggest accomplishment is their unending ability to connect with their fans around the world. "Our audience is constantly expanding," says Chrissy. "We've got younger girls, teenagers (including boys! ), and parents coming to all of our shows and they are having a great time. We've had some great conversations with them and we really love getting their feedback." That feedback-whether it comes through letters, after-show meetings or one-on-one time spent with young girls on recent mission trips-translates into some of the real life moments Chrissy, Alisa and Kristin write about on their albums. Room To Breathe captures those poignant moments that come straight from the heart. Filled with soaring harmonies and brimming with a personal style that is quintessentially their own, the CD's tracks include the album's first radio single, "About You," an up-tempo pop melody about learning to take the focus off yourself and make it all about God. "Dead Serious," the track ZOEgirl calls the most fun song on the album, is a tribute to "all of those kids who really are standing up for what they believe, even though it's not always the most popular thing to do," Kristin explains. The album's title is pulled from a song called "The Way You Love Me," written by Chrissy and songwriter Lynn Nichols. "This song talks about how it's so unfathomable to realize how much God loves us despite what we do every day," Chrissy explains. "We can't ever fully grasp how he could love us so much that he died for us. The lyrics say, 'You gave me room to breathe, a place to get away. I'm standing in your presence with a debt I can't repay.'" One of the album's most honest and affecting songs is "Scream," a lyric and music written by Alisa and inspired in part by some painfully revealing stories told by girls the group met on the road and while on a mission trip. "There are girls out there who admit to all kinds of self-destructive behaviors like eating disorders, drug abuse, drinking and cutting themselves out of a desperate need to numb the pain and cry out for help," Alisa shares. Does anybody know how I feel? Sometimes I'm numb; sometimes I'm overcome-Do I have to scream for you to hear me? Do I have to bleed for you to see me? Because I grieve and you're not listening to me. The song was a shower of emotions for Alisa, who was jointly inspired by hearing the deep hurts shared by the girls she'd met, and in honestly grieving her own personal pain and dealing with depression. "It took me two hours to write the whole song, and it was as if in that two hours I went through the pain of it and the healing of it. It was as if God just poured it out of me. It was so powerful." Having traveled on summer mission trips for the past two years, Chrissy, Alisa and Kristin have gained a renewed passion and vision to reach the world. As part of that effort, they have launched ZOEgirl Missions, a way to partner with their listeners in reaching out to areas in need. The first official ZOEgirl Missions trip took place last summer in Quito, Ecuador. Partnering with Big World Ventures, ZOEgirl took a missions group to visit retirement homes, play with children in orphanages, perform drama and music, and participate in various work and building projects for churches in Quito. This July, ZOEgirl is planning a second trip to Ecuador, partnering again with Big World Ventures, and taking various teams with specific gifts. Chrissy, Alisa and Kristin will bring with them construction teams, music and worship teams, and teams that will visit nursing homes and orphanages. They will spend time with the residents, nurturing and serving them with whatever they need, whether it's a haircut, a hug, or someone to sit with them and hold their hand. It's ZOEgirl's hope that they will touch those who experience so little human touch. "If we hadn't done these trips we wouldn't be the group we are now," says Alisa. "The girls who have gone on these trips have inspired more songs than they know." "These trips have really opened my eyes to the world," Chrissy adds. "It has given me a new appreciation for life and has taught me so much in the process." Glancing back, in the rearview mirror of their career, it's the relationships they build, the lives they touch and the impact they make for Christ that fuels this trio of women more than anything else. "At the end of the day, in 20 years, I want to get a letter that says, 'I gave my heart to Jesus at a ZOEgirl concert,'" Alisa says. "To me, that's success. It's great to sell albums and win awards, but we aren't truly successful if we aren't leading people to heaven. That's eternal." Chrissy adds, "If we were remembered for anything else it wouldn't seem like we had fulfilled what we know God has called us to do."